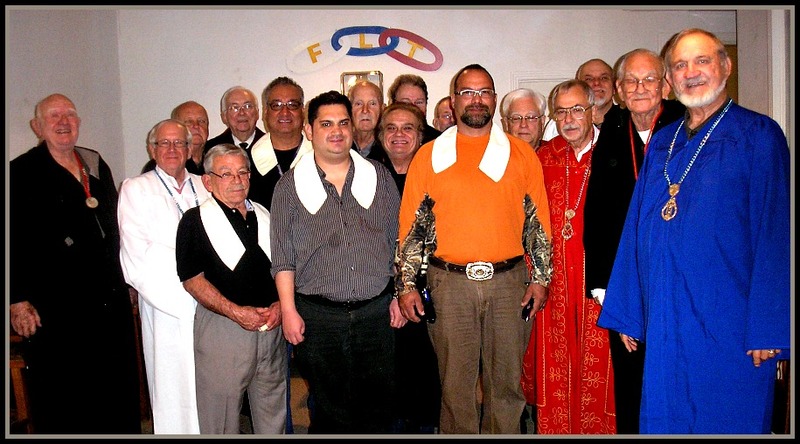 Our Lodge meets the 1st Mondays & 3rd Wednesdays of each month at 6:30 p.m.
Garland I.O.O.F. 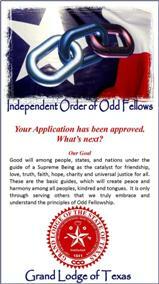 Lodge invites you to explore the Community that is Odd Fellowship. Our lodge is a family of brothers and sisters working to build a world that we want to leave to our children's, children's, children. We offer: A unique environment of caring and supportive folks to learn and grow with. We strive to become better people as we provide a way to support many local, national and international charities. The moment you walk into our Odd Fellowship Hall you will be met with the warmth and comradery that 200 years of our foundational beliefs of Friendship, Love, and Truth have built. Garland I.O.O.F. Lodge is, amongst other things, a charitable organization that uses much of the money it brings in to give help to worthy organizations, events and individuals. If you are looking for a opportunity to be of service to your community, while enjoying making new friends, there is a place for you in this organization. We seek people of good character that believe we can make a difference in our world. Our Lodge can use your help. The work we do is worthwhile and important. The more active members we have, the easier it becomes to do our work and the more we can take on. We invite you to join in that work by becoming a member of the Lodge. The Independent Order of Odd Fellows is a fraternal organization founded upon the principles of Friendship, Love and Truth. These three principles, we believe are essential for the future of our country, our community, our society. Friendship is the strongest bond of our association. As a member you are bound to participate with your brothers and sisters to safeguard our members and families in times of adversity and aid those in distress. Love is the link which requires neighborliness to our fellow human beings, which comes only after all hatred, envy and selfishness have been laid aside. Truth is the standard by which we value people. It is the foundation of our society. United together we can make a greater impact on our community than we can as individuals. We hope you will consider joining us at Garland Lodge No. 304 in our effort to make a better community and world. Our Lodge received a wonderful letter of thanks from Jonathan’s Place. Below is a copy of it for you to see. Reading this letter makes us continue to be proud to be part of our organization that steps up to help these children. I hope we continue to do this in the coming year – it is beyond rewarding. So happy to see how much they appreciate the laptops they were able to buy with our last donation! God is good by allowing Garland Lodge #304 to have the prosperity it enjoys so that it can share with others in, first of all - His name, and secondly in ours. Above - John Beaber, Peggy Smith and GM Grady Smith purchased 10 turkeys at Kroger's on Monday Nov. 19th and delivered them to the Good Samaritans of Garland food pantry to be given to the needy for Thanksgiving. Pam Swindig the Executive Director of Good Samaritans of Garland Inc. was very thankful that Garland #304 was able to help. ​Grand Master Grady Smith presented as promised his personal check for $350 to the raffle winner, John S Beaber. John chose the cash over the deer rifle. John is a member of Garland Lodge #304. The raffle drawing took place on September 9th at the Retirement Home Pilgrimage in Ennis, Texas. The net proceeds of the raffle go to the Grand Master's charity which is Jonathan's Place a home for abused and neglected and foster children. Thank everyone who bought a ticket to help make the Garland Lodge #304 raffle a big success. 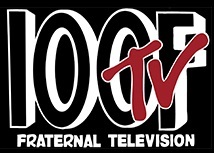 ​Garland I.O.O.F. 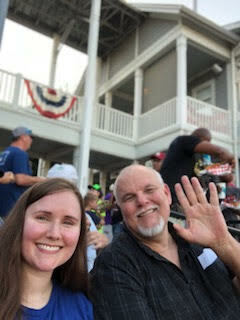 #304 members had a fantastic social night at the Dr. Pepper Ballpark in Frisco, TX. 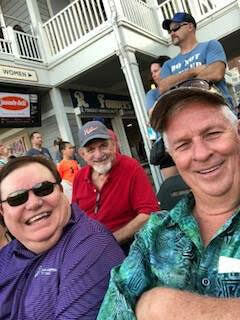 They all enjoyed a Rough Riders game and all you could eat and drink. A big thank you goes to Brother Paul Wilson for getting us incredible Founder's Club seats with a great food and drink package. Bro. 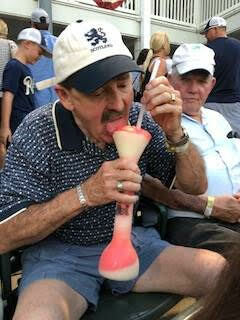 Paul Wilson enjoys frozen drink. ​What a great time we all had on August 9th at our Jonathan's Place Ice Cream Party with the kids! There were 13 kids and a few staff members and several Garland #304 members as well! Topper the Clown entertained the kids with balloons and his fun magic show - as did Brother LC as he entertained them with songs and games to keep them distracted while Topper set up and got ready for them! They all LOVED the ice cream and the fun night! The kids were so appreciative! It was well worth the time and money to give these kids some fun in their little lives! We had some treats left over, so we took them over to the cottage where the teenagers live. They were equally excited to get them! Thanks to all of the Lodge members who pitched in and helped out. Unfortunately, we didn't get any pictures of the ice cream dippers (Reezin Swilley, Connie Christensen and soon-to-be-member Bronwyn Banks), but they kept the ice cream flowing! Brother Chance Ables was GREAT with the whipped cream, sprinkles and cookies! All in all we had a great time and the kids were in seventh heaven. Thanks again everyone for this fun event! Doing nice things for others is why we do what we do! Our lodge has started a new fundraiser. 100% of the proceeds after the price of the rifle will go to benefit the children at Jonathan' Place. (see link) https://www.jpkids.org/ (see ticket below for information) Anyone interested in purchasing tickets may send us a message. THURSDAY, AUGUST 9, 2018 6:00 P.M. Please RSVP so we will know how much ice cream to buy! We are so proud to announce that we have our very first Grand Master from Garland #304 who was installed at Grand Lodge on March 19th 2018. Garland Lodge #304 was instituted in 1884. You would think there would have been at least one since then, but Grady Smith is the first. May he have a wonderful year! On 4/16/2018 several of Garland #304 members met at Babe's for a fun night in Garland, Texas. 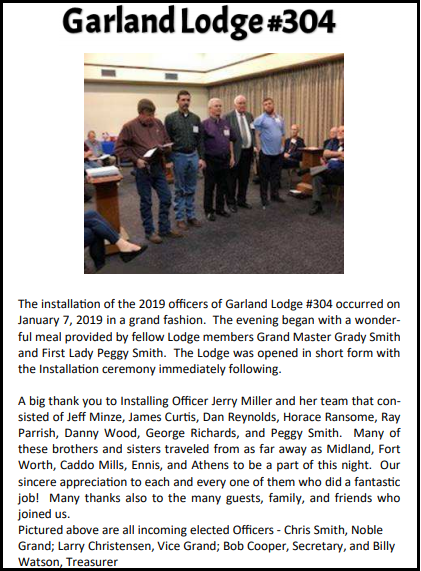 Monday night January 29th Garland Lodge #304 had 13 Degree Team members traveled to Farmersville to put on the Initiatory Degree for seven new Farmersville Pride Lodge #228 candidates. There was Good Food, Good Fellowship and a Good Degree! All enjoyed themselves and it is good to see one of our older lodges come back to life. Pride lodge had gotten down to just five members. With the added members they should be able to do some good Oddfellowship. All the new members are very positive and are looking to see the lodge grow. We wish them well. Above left pic: John S. Beaber propounds questions to candidates. Above right pic: Billy Watson, Connie Christiansen, Peggy Smith and Earnest Jones look on as candidates receive obligation. 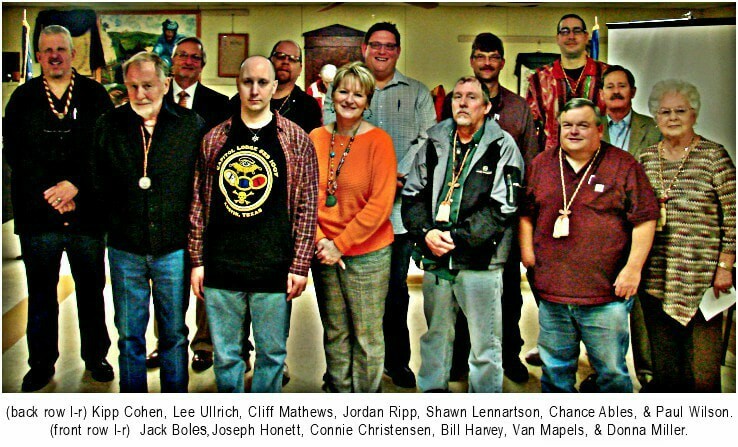 Below pic: Seven Farmersville Pride Lodge No receive the Odd Fellows obligation. Garland Lodge No. #304 had an open installation of officers at our new lodge home this year. The public was invited to attend. We had many guest. Prior to the installation a wonderful dinner was served. The following members were given the charge of their office Noble Grand - Roy Bragg, Vice Grand - Chris Smith, Secretary - Bob Cooper and Treasures - Billy Watson. See picture of new Lodge Hall below and installed officers in slideshow to right. Garland IOOF Lodge members raided their closets for unused coats and jackets which were donated to Good Samaritans of Garland Inc. to help the local homeless. There were about fifty of them in all. The lodge also donate a check and a few food items. 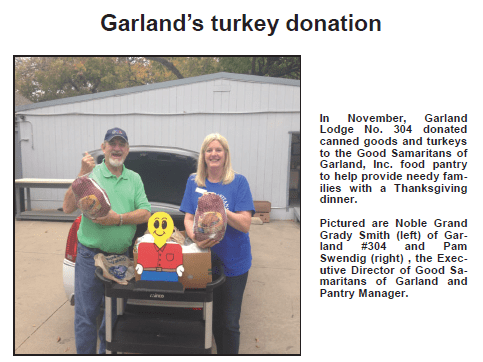 Pictured are Pam Swindig the Executive Director of Good Samaritans of Garland Inc. (left) and John S. Beaber Noble Grand of Garland #304 (right). Garland Lodge No. #304 had their installation of officers for the new term. The following members were given the charge of their office Noble Grand - John S. Beaber, Vice Grand - Butch Ford, Secretary - Bob Cooper and Treasures Billy Watson. See slideshow below. Click F5 if picture do not show. On Saturday May 7th Garland #304 sponsored an Outdoor Degree Rally at Grady Smith’s home place in Caddo Mills, Texas. Around six o’clock about forty five Odd Fellows from Garland lodge and visiting lodges gathered for a hotdog dinner around the outdoor kitchen which was located next to a cool pond. The white catfish were jumping, the atmosphere was inviting and the fellowship was fantastic. At dark the members and visitors met under the canopy of several huge oak trees. There were torches at each lodge station. The podiums were made from logs. Nearby there were two bonfires. The warmth and entrancing flames from the bonfires and the torches gave off a mysterious and inspiring atmosphere. The degree was presented in robes with all the proper equipment including music and slides. Garland lodge brought in two more candidates receiving the Initiatory Degree. We welcome brothers T.K. Kneedler and William Pardue to our ranks. All who attended the degree came away with a lesson that was extremely meaningful. It will not be soon forgotten. Many thanks go to Grady Smith, Noble Grand, and wife Peggy who worked tirelessly to prepare the food and his son Chris Smith, who did the cooking and helped arrange the outdoor setting for the degree. If all the slides below do not show click the F5 key. Garland IOOF #304 initiated three new members on March 28th. In the picture above (from left to right) are Charles A. Wall Jr., Dennis L. Williams, and Roy L. Bragg.... pictured with Garland #304 NG Grady Smith. 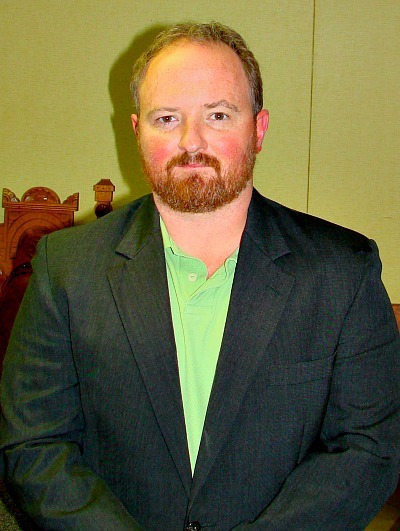 We also reinstated Chris Lambert on March 7th. (not pictured). We are very happy to have them as brothers. for two days at the Grand Lodge, raising money for Our lodge! 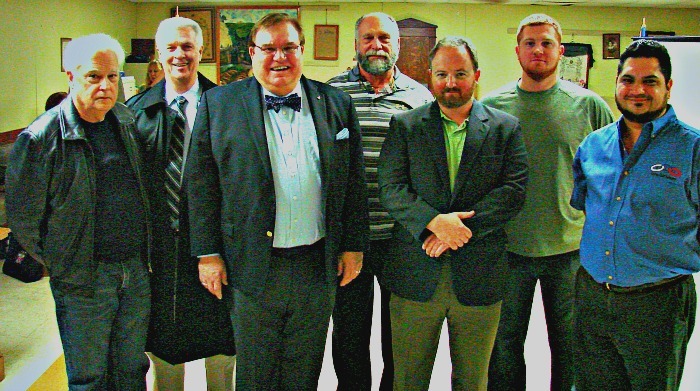 On January 18th DDGM Jerry Miller installed the new officers for Garland Lodge #304. The following members were installed in to their chairs. 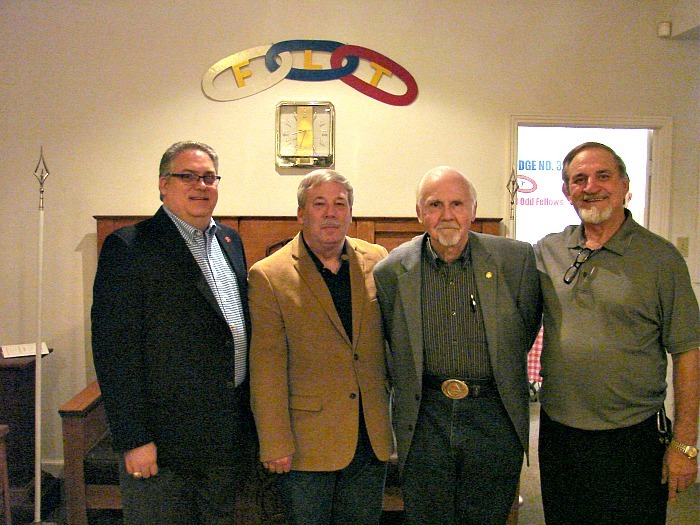 Noble Grand - Grady Smith, Vice Grand - Michael Dyer, Secretary - John S. Beaber and Treasurer - Larry Christensen. Grand Master John Linden worked as part of the installing team. Past Grand Master BJ Miller was also present. Garland #304 Lodge served a wonderful meal and we all had great fellowship. On January 16, 2016 five of our lodge members went to Corsicana Lodge #63 to receive their 1st, 2nd, & 3rd degrees. 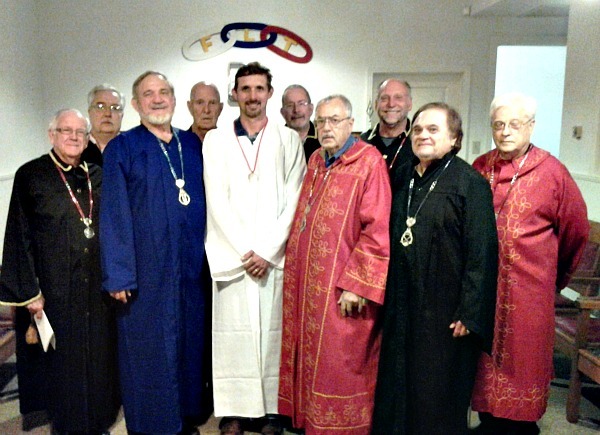 We also had two new candidates that received all the degrees including the initiatory degree. The top picture shows all of them in a group and the second row has individual pictures of our newest members. Corsicana Lodge served a wonderful lunch which is depicted on the bottom row. Donations received go to the Texas Visual Assistance Program. On November 16th Garland #304 initiated four more candidates. We have doubled our membership since January 2015 and we have four more candidates to interview in the next month. 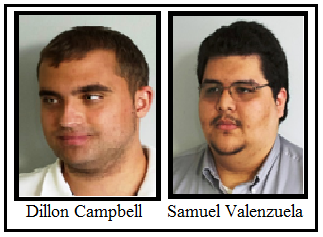 The four candidates form left to right are Justin Fonseca, Archie Anderson, Ricky Cortez and Xavier Hernandez (left pic.) The picture to the right shows the degree team with the new members. A special thank you goes to PGM B.J. Miller from Dallas Lodge #44 for his help with the degree work. Garland Lodge #304 celebrated their 131st birthday (June 25, 1884) by bringing in six new members. They traveled to Corsicana Lodge #63 in Corsicana, Texas on June 25th to receive the Initiatory Degree. One of the six new members is Butch Ford, who is a newly reinstated member (single picture at left). 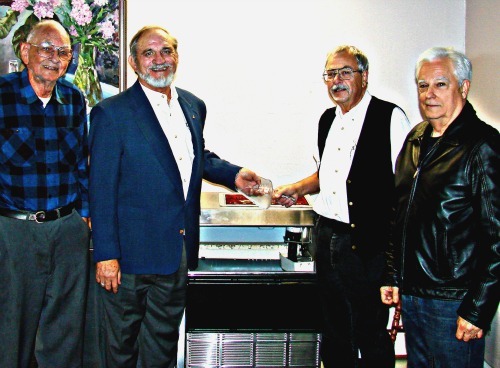 The other five new members are (R to L in group picture on right) Jerry R. Garey, Reezin Swilley, Kenoth H. Flournoy, Larry B. Christenson, and Tom Fulton. Included in the picture are Jane Dobson (who works for the I.O.O.F. Grand Lodge office and is a new member of Corsicana Lodge #63) and PGM B. J. Miller (far left in group photo) who was the Degree Captain. Corsicana Lodge served a wonderful meal. All present enjoyed themselves and had wonderful fellowship. On June 15, 2015 Garland #304 had a good meeting and the chicken dinner was good too. We ended up having three official visitors rather than just one . The Official visitors were Deputy Grand Master Johnny Cantrell., Grand Treasurer Henry Blahuta, and District Deputy Grand Master Jerry Miller. There were several other visitors from different lodges in the area. We all had good fellowship and our lodge meeting went well. We have great plans for our lodge. We now have six candidates waiting for their initiatory degree. We will schedule that soon. If there is anyone in the Garland, Texas area that would like to be a part of a great organization please feel free to contact us. On April 27, 2015 District Deputy Grand Master Jerry Miller made her official visit to Garland Lodge No. 304. Pictured above from left to right are Grady Smith, Michael Dyer, NG. Billy Cryer, Horace Ransome, D.D.G.M. Jerry Miller, Jerry Cortez, and Don Bean.